15.2 x 15.2 x 5.8 cm. 6 x 6 x 2 1/4 in. In 2002 Anya Gallaccio installed seven felled oak trees in the monumental space of the Duveen Galleries at Tate Britain. Stripped of their branches but with their bark intact these powerful structures continued Gallaccio’s dialogue between ‘nature’ and ‘culture’, ‘permanence’ and ‘ephemerality’. The English oak tree symbolises tradition, permanence and value. The oak doesn’t even reach its prime until it is at least 100 years old. This association of the oak with the long-term – much longer than human life – contrasts markedly with the short-term nature of contemporary life. 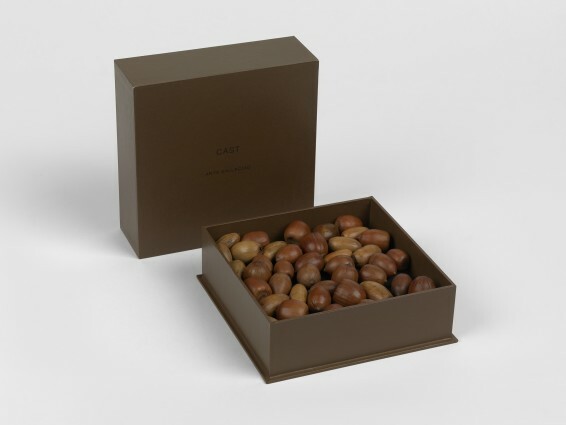 Cast brings together a handful of real English acorns and one unique cast bronze acorn in a box specially produced by BookWorks for the project. The buyer is invited to plant the acorns for the future, keep them to dry out and die or throw them away, leaving only the cast acorn. Cast has both the association with throwaway culture and that of permanence.